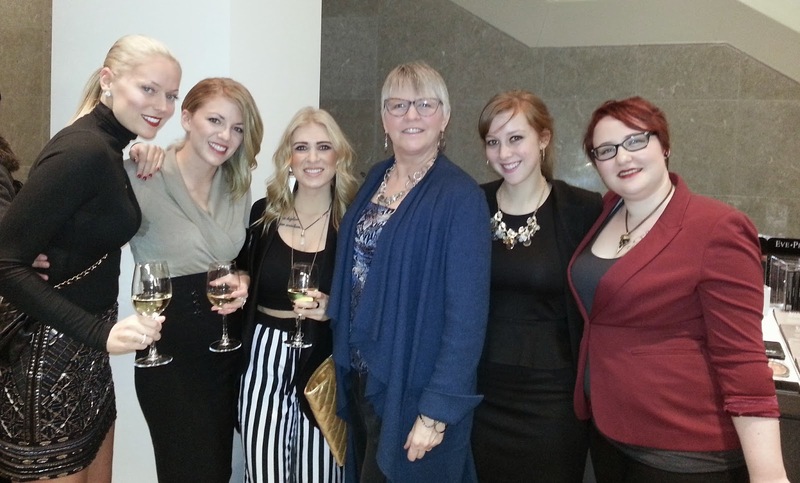 The end of November held Blanche Macdonald's annual fashion design grad at Curlique Beauty Boutique. A year ago they moved the grad show to this new location and I think the changed format is fabulous. The venue is much more intimate, which lets me see the garments up close and personal. Two shows are offered every year - an invitation only Media Preview where we see an edited selection that focuses on the best and brightest in this year's graduating class, and a parent night where all the students hit the runway to showcase their work. Fashion Lyrics 2013 began downstairs in the boutique where we could mix and mingle with other media, teachers and students. White and red wine along with delicious cupcakes by the Bake Sale Baking Co. kept a smile on everyone's face. I only tried 2 cupcakes varieties and they were both amazing - Red Velvet with Cream Cheese Frosting (you were right Claudia DaPonte - loved it) and Salted Caramel which is always a favourite for me. Guests covered a wide range of the industry from designers, to media, to stylists to producers and more. It was great to have a few moments here and there to catch up with industry friends as well as connect with a few of the students and staff to get their feedback on the evening. 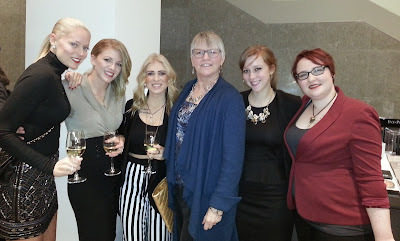 Cell phone image of me with some of the amazing grads showcased this evening! Upstairs they had a raised runway (a total plus at any fashion show) framed by clear acrylic chairs each holding a black swag bag. Very classy. Rows were only a few deep so we all had a good view no matter where we sat. In a side room, the 16 students being featured this evening had their portfolios on display. This is always a first stop for me as I find their fashion illustrations offer a window into the student's creativity and future potential. Combined with their final garments - it gives me a better feel for each. There were many stand-outs in this area and I hope to feature a few in the future. For the show, I was lucky to snag a seat right at the end of the runway - the perfect place to see not only the garment, but construction details. 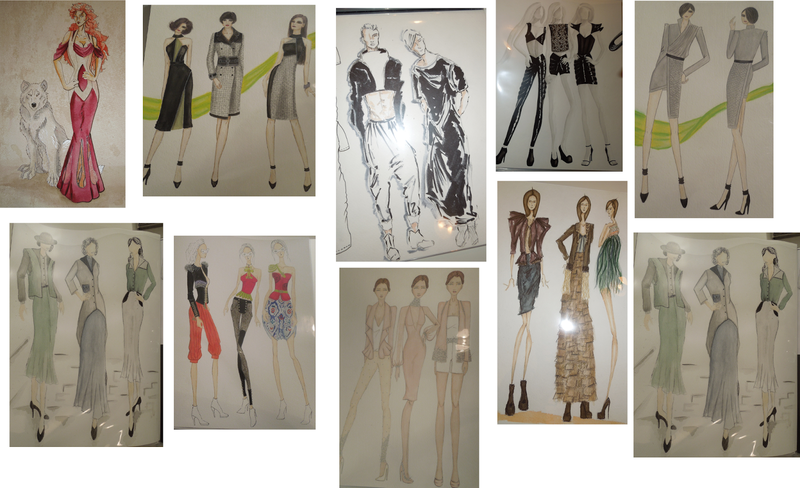 A few illustration images show on my little camera - please forgive the poor quality. Fashion Lyrics 2013 offered strong collections overall that covered a wide variety of styles. The focus tended more toward high-end wear, but there were a few exceptions to keep the mix interesting. I loved the variety of fabrics, the incorporation of unusual angles and shapes in some of the silhouettes, out of the box menswear, a few ethnic influences and some exciting couture pieces. Because of the variety and strength of this grouping, it's way too hard mention any one student in particular. Kudos to all on a job well done and just know there were many garments I coveted. Also, thanks to Blanche Macdonald for making the overviews on each collection, included below, available. Kari Appelquist - Overall Achievement - Her collection appropriately titled “The Fallen” was inspired by angels, fallen into a world of darkness. Her clever use of contrasting leathers and satin, peppered with delicate gold chain detail, takes us into a world where women can exalt their strength and more iniquitous sides. Katrina Chen - Special Achievement in Pattern Making (Honourable Mention) and Special Achievement in Garment Construction - Moved by the power and radical geometry of lightning, Katrina conceived a sleek and feminine collection focusing on the “simplest qualities of luxury”. Using acetate crepe, satins and organza’s, Katrina’s collection titled “Force of Lightning” shows a modern take on the workingwoman’s wardrobe. Sam Elias Ghahremani - Moved by the power and agility of the bald eagle, Sam designed a collection for both men and women using treated leathers, cotton and wool. Danielle Jensen’s collection “Maiden” was inspired by the surge of women empowerment during WW2. Danielle used components of utility wear and military inspired garments to create a collection that is interchangeable from day to night. Dorothy Ting - Special Achievement in Design - made a trip to France in 2012, and more specifically Chateau Versailles. The moment she walked through the Mirror Halls of the renown Palace, her debut collection was born. Combined with her love of ballet, Dorothy infused her designs with the grandeur of crystal chandeliers and the fragile beauty of Swan Lake. The bold structure of her garments brindled with delicate crystal embellishments and raw edges make Dorothy’s debut collection a remarkable achievement. Janic Procyk - Overall Achievement - The southeast Saskatchewan native used the dynamism and swagger of the all-to-often vilified Queen in traditional fairy tales, as the basis of her collection. Her designs transition from sophisticated suits for the workingwoman, to sultry eveningwear dripping in conviction. Li Liu - Student of the Year - Chinese Buddhist temples are at the apex of Li Liu’s collection. Her fervor for engineered geometry and motley colours paint the backdrop of Li’s collection. Lotus thrones, golden lanterns adorned with flower and fruit offerings, endless knots, ceremonial drums and bells are just some of the visual elements incorporated into this feast of fashion. Reghan Blake - Special Achievement in Pattern Making - takes us from the beach to the ballet with: bathing suits and cover-ups, fitness wear, casual separates, cocktail dresses and evening gowns. The bathing suits in this collection feature chiffon, fabric peonies and Swarovski crystal embellishments inspired from her life as a dancer. Joanne Huang is enchanted by decadence. Chanel, Dior, Hermes-oh my! Her tribute collection pays homage to the classic greats of fashion. Tania Fergaru - Special Achievement in Collection Interpretation - Wanting to infuse clothing with cultural elements from her native Mexico, Tania Garcia used the richness of Aztec, Mesoamerican art and textiles as her point of departure. With a patient and feathered eye, Tania spent countless hours hand-beading, embroidering and cross-stitching graphic patters influenced by the culture so near to her heart. Roginett Ligsay - The foundation for Roginett’s collection was discovered when he mixed his love of Grecian architecture, the country’s Orthodox Catholic dress and an article he read on “Male Gender Flipping”. Roginett forged an eccentric collection dripping in lustful appeal and street swagger. Yinan Wu's trip to the natural history museum as a child planted the seeds for his inaugural collection. The gargantuan skeletons, and sweeping wings from a vanished time are at the heart of her designs. Transparent draping over skin-like fabrics with detailed boning are just some of the design elements incorporated into Yinan’s work. Candice Grenard - A born and bred Parisian, Candice brought the cultivated beauty of France to Blanche Macdonald Centre. Her assured collection in hunter green is fit for any bona fide bourgeois. Annie Pahl - cello player turned fashion designer - was touched by “The Swan’s Ballet”, from Camille Saint-Saens’ Carnival of the Animals. Crafting pleated dresses that mimic cello strings and appliqués in the shapes of Fortes, Annie’s collection of amorous gowns captures the essence of this beautiful and timeless score. Paradee Chanyatanavut - Designing clothes that she “would want to wear”, the Thai native used dream catchers as her point of departure. With a focus on delicate and arresting details, Paradee explored the combination of straight lines and circular shapes with contrasting opaque and transparent textures. Kira Sam - Special Achievement in Design and Special Achievement in Portfolio Presentation - Her collection “Die Walkure” was inspired by Wagner’s play “Ring Cycle”. The Calgary native with a background in theatre, used the iconic character Valkyrie Brunhilde as the muse for her costume designs. Exploring the strength of the classic heroine, Kira’s costumes mark the journey from legend to warrior, to mortal, to prize and ultimately scorned woman who meets a tragic end. Kira’s use of Mongolian lamb, pony hair and scale maille resulted in a collection seeping in dramatic flare.